When you stay at Hotel Tahiti Nui you are located right in the heart of the city of Papeete, providing convenient access to the shops, restaurants and nightlife. From here you are also within walking distance of Papeete Town Hall and close to Papeete Market. There are 91 air-conditioned rooms and suites, each offering cable tv, complimentary wifi and patios or balconies. Hotel facilities include a day spa, restaurant, lounge bar and a fitness centre. 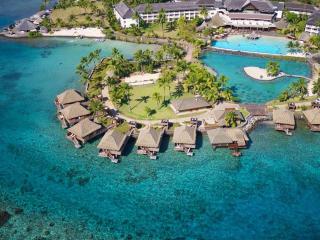 Located on its very own private beach less than 5 minutes from the International Airport, InterContinental Resort Tahiti offers luxury accommodation with sweeping views of the lagoon, reef and ocean. Featuring Tahiti’s famous overwater bungalows, the resort enjoys easy access to a variety of shopping, dining, activities and attractions and is just 10 minutes from the centre of Papeete. Enjoying views of sister island Moorea, the resort offers a fantastic range of onsite facilities and is ranked among the best on the island of Tahiti. Located just minutes from the Faaa International Airport, Manava Suite Resort Tahiti offers stylish, luxury accommodation with a distinct Polynesian feel on the west coast of Tahiti. Set in the charming town of Punaauia, right on the beach, the resort is home to an excellent range of onsite facilities. Just minutes from Taapuna Surfing, the resort is also close to popular snorkelling and diving sites such as the Lagoonarium and the administrative and historic capital of Papeete. Located only 500 metres from Faa`a International Airport in Papeete, Tahiti Airport Hotel offers the perfect location for your airport stopover. 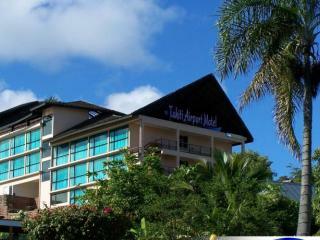 As well as this the hotel is only 6kms away from the bustling capital of Papeete. Car Hire is available at the accommodation on request giving you an option to explore the area. Rooms are air conditioned and offer Free WiFi as well as a complimentary continental breakfast. Tahiti Ia Ora Beach Resort managed by Sofitel is located on the beachfront in Punaauia, Tahiti. 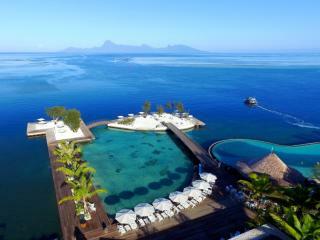 With stunning views over the lagoon of Moorea the idyllic sunset photo is not too hard capture. 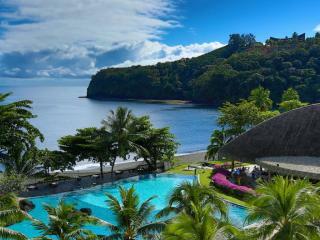 Being within close proximity to many other popular attractions, Tahiti Ia Ora Beach Resort managed by Sofitel is a great option to unearth Tahiti and all it has to offer. Tahiti Pearl Beach Resort is a great 4 star accommodation choice located on Lafayette Beach boasting stunning views of the Ocean and Bay. This is a great choice of couples, families and business travellers. 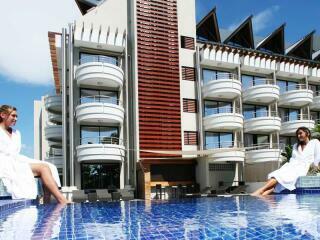 Positioned within close proximity to Papeete airport and many tourist attractions.